These Halloween party food ideas can turn your gathering from so-so to spooktacular. Halloween has always been one of my favorite holidays. From designing the perfect costumes, to trick-or-treating and creating creepy and spooky treats for our guests–it's the best! Here are 17 fun and spooky Halloween food recipes with slimy yet delicious treats and meals for your guests. This list includes spooky Halloween appetizers, desserts, and even main dishes, so you're sure to be covered no matter what kind of Halloween party you're planning on throwing! Read on for the best Halloween party food ideas for your next spook-fest! This is such an easy party food to make and decorate. If you are someone who isn't generally partial to taking on over-the-top creative food projects, then this is a great way for you to decorate without stressing about creativity. Admittedly, bean dip hardly seems to be the most festive dish for any holiday, but with these ‘tombstone' chips to help decorate, the dip becomes the perfect background for this dreadfully delicious party food! Great for parties! Again, if intricate decorating is not your forte, then these simple and delicious pops are just what you're looking for! Who doesn’t love food on a stick? Simply dip your marshmallows in melted chocolate or icing and roll them in festive sprinkles to get this creative desert. 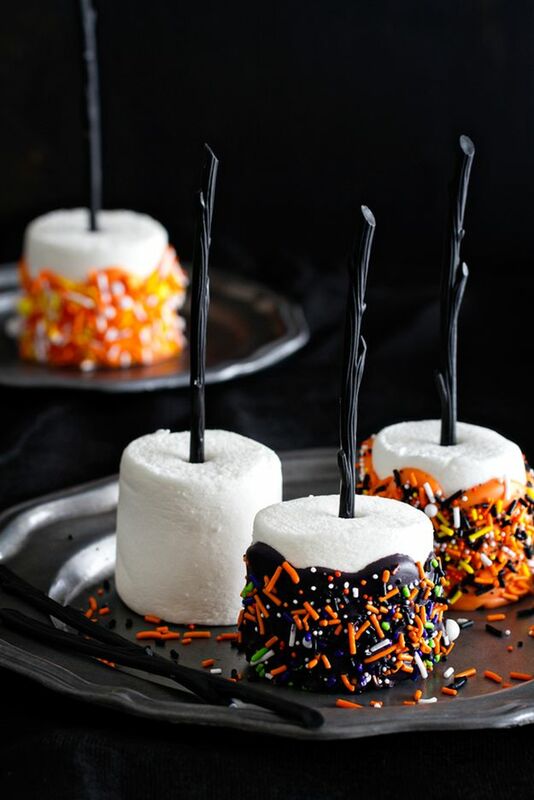 These Halloween marshmallow pops are super easy and affordable. Give them a try! This is perfect for a fall snack, Halloween party, or gift for the neighbors. Put this out at your next fall get-together and see if you have any at all left to pack away — my bet is you won't! This is a sweet and salty mix to keep your guests happily munching throughout the entire night. Simple to make and easy to display as all you require is a bowl. This colorful treat is decorative all by itself. Similar to the bean dip, this graveyard chocolate cheesecake dip is simply to die for. (Yes, of course, pun intended.) It's insanely easy to make, and with the crumbled Oreo topping, it's scrumptious as well. 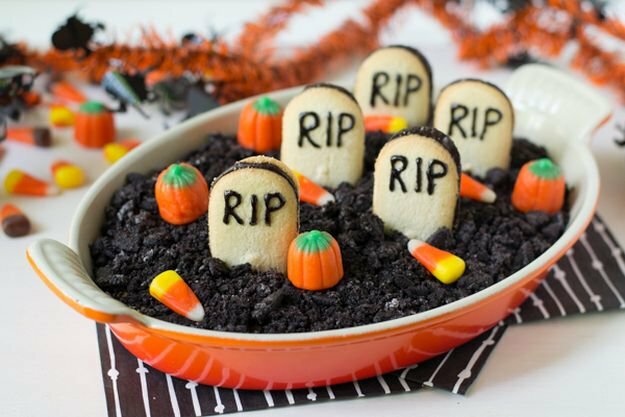 Milano cookies work beautifully as the tombstones, but I'm sure you could use an assortment of cookies to replace them as well! 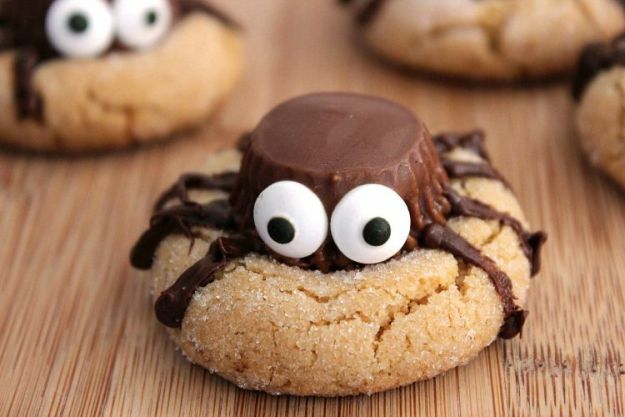 Okay, I'm generally not one for spiders, but these Halloween peanut butter spider cookies are amazing. They are the only creepy crawlers you will ever find on my table! These cookies are just the right balance of creepy and cute with the added bonus of being totally yummy. A peanut butter cup on a peanut butter cookie? Your little monsters will surely love these cookies as well! These mini chocolate bat bites are such a festive treat to make this Halloween. You can't go wrong with peanut butter cups and Oreos! What could be a more winning combination? With only 4 ingredients, you can have them prepped and on the table in mere minutes. You'll be amazed at how quickly these little-winged treats fly off your table. Halloween finger foods, you say? This is literally what you are looking for! Leave behind the cutesy and elementary spooky treats and take a walk on the scary side with these creepy witch finger pretzels! Set out these shiver-inducing snacks and watch as your guests ‘eww' and ‘ahhhh' over them in true Halloween fashion. These will be a sure crowd-pleaser. If you're looking for something to fill up your guests with more than just sugar, then these entree-like shredded chicken and rice stuffed peppers are for you! They are delicious and simple to make, and the orange bell pepper acts as the perfect makeshift pumpkin to complete the festive decor! This is sure to be a big hit on your Halloween table. Okay maybe I'm just biased toward Milano cookies, but who isn't, really? These layered peanut butter mousse graveyard cups are drop-dead delicious. (Yes, yes, let the puns continue!) It's a great way to make your Halloween more creepy and unique. While the glass cups look nice, it is just as easy to use clear plastic disposable cups — especially when half of your guests are kids with little hands. Now this one surprised me as I had previously only ever made tree bark for Christmas. But this Halloween take on delicious boo bark is fantastic. The best part? You can essentially customize your boo bark to fit the preferences of your guests. If you're like me and have some friends with specific dietary restrictions, you can add or leave out the candy that isn't wanted. Alright everyone, loosen your belts a notch. This is a brownie-cookie combo that is sinfully yummy. Turn brownies into a fun and kid-pleasing Halloween treat by using chocolate peppermint patties to decorate them as vampires for an added fright factor. 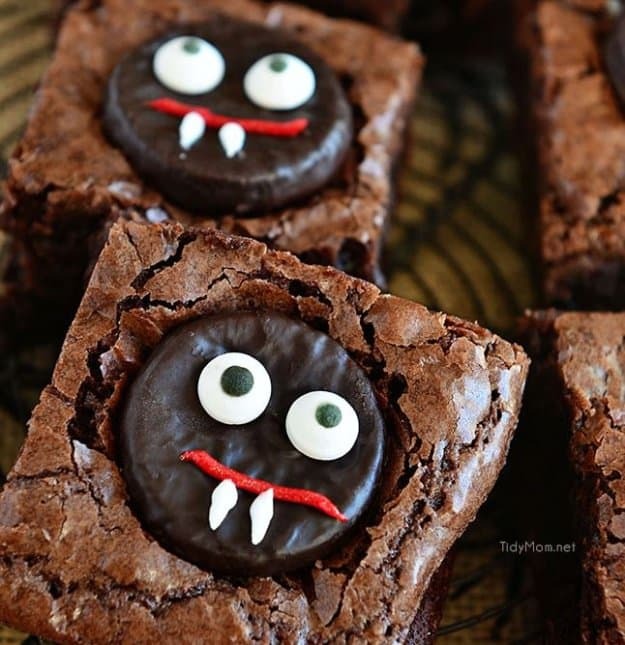 These easy minty fudge vampire brownies are sure to please the kids and adults alike. Of course, a list of Halloween party food ideas needs to include some creepy crawlies. These Jell-O worms are amazingly disgusting. They are a great way to make your Halloween more spooky and unique. By using bendy straws, you are even able to give the worms a certain amount of reality — you know, just in case a bowl of worms was still too appealing for you. If you're looking for Halloween party food ideas that could act as more of an entree the kids will still love, these Jack-O-Lantern mac & cheese cups are sure to do the trick. In fact, you can leave out a marker and clear cups and let the kids go to town decorating their own pumpkin face. Then simply fill up the cup with mac & cheese! Need a last-minute party treat to put together? These Halloween muddy buddies are your best bet. There are no complicated baking and measuring requirements with this one. The recipe makes use of cereal, candy, and chocolate, but you can experiment with different types of ingredients to suit your liking. Here's another recipe adults and kids alike will love: no bake peanut butter mummies! 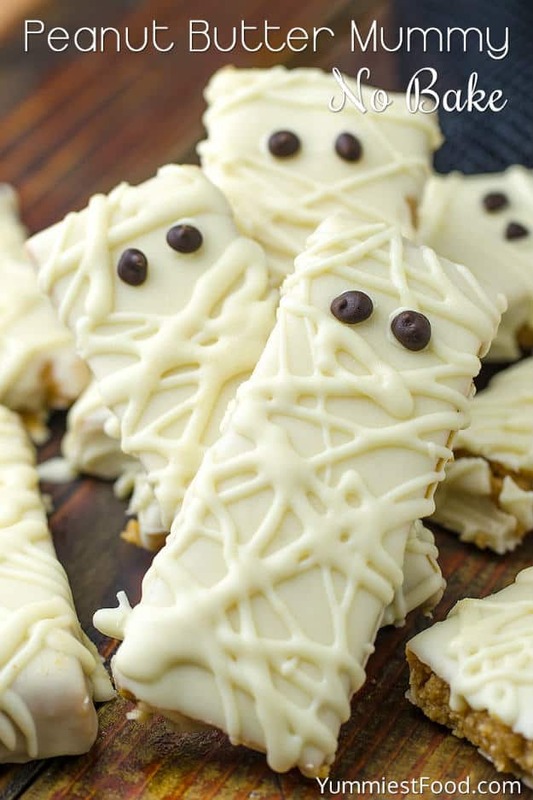 This recipe cleverly uses melted white chocolate chips to make the mummies' bandages. You can also use cookie cutters to create whatever spooky shapes you fancy. 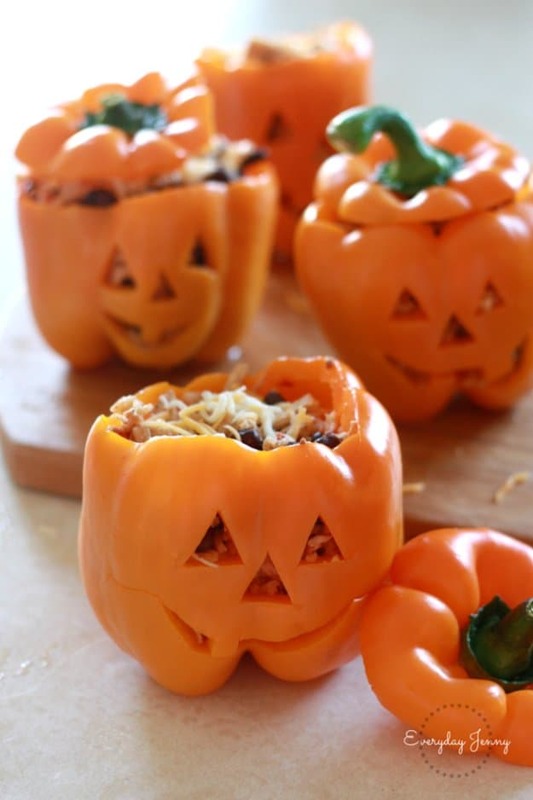 Want more savory Halloween party food ideas? Serve this at your party, and kids will be wondering what it could be! Believe it or not, this toxic waste mac and cheese is actually healthy. The recipe calls for spinach, but I like to add in a few more greens (like kale) to my pot of sauce! Wasn’t that fun? Now you have an assortment of spooky Halloween party food ideas you can whip up this Halloween season. Of course, you can get totally creative and add your own spin to any of these recipes. Who knows? Maybe you'll come up with your own unique concoctions. With these serving as inspiration, you'll undoubtedly host a Halloween party your little monsters will remember for years to come. Up next: 19 Spooky & Fun DIY Ideas to Throw a Halloween Party at Your House! Editor’s Note: This post was originally published on October 8, 2016, and has been updated for quality and relevancy.